Light carries the information about the composition of the analyte from the spark stand into the optical system for analysis. Years ago, scanning monochromators were produced with only one detector. The optical path was configured according to Czerny-Turner, for instance, whereby the grating was rotated to record the entire spectral range. Nowadays, polychromators are usually mounted on a Rowland circle according to Paschen-Runge in a spark spectrometer. Neither the grating nor the detector positions are moved, thus fixing a stable focal plane. Spark emission spectrometry requires a spectral resolution in the range of the line bandwidth. This helps to avoid numerous line overlaps and the number of correction factors in the calibration function can be kept low. This brings advantages for the verified correctness of analysis data. The spectral resolution can be achieved via the focal length, the number of slits in the dispersion grating, the resulting linear dispersion and skilled adjustment of all optical components. Years ago, focal lengths of over a metre were not uncommon and such optical systems were large enough to be walked in. The larger the optical system, the more difficult it is to ensure mechanical stability. If the vacuum UV range is to be made accessible by evacuating the optical system, the optical chamber must not exceed a certain size. Producing gratings with a large number of lines, which in turn ensure a theoretically high spectral resolution, is no longer a technical problem nowadays. The higher the number of grating lines, the more limited its usable wavelength range, though. Covering all the necessary emission lines requires a wavelength range from 120 to 800 nm. Modern stationary systems typically work with focal lengths of 500 to 1000 mm and grating line numbers of 1200 to 3600 per mm. This makes it possible to attain first-order reciprocal linear dispersions of 0.5 to 1.0 nm/mm. Exit line widths of 15 µm achieve spectral resolutions of approx. 7 pm. Whereby α is the angle at which the light beams enter the grating and β are the angles of reflection of a certain wavelength λ. Further, d stands for the groove spacing of the grating lines and n is the order of diffraction. Gratings can be developed in etched or photographic form (holographically etched gratings). To increase light output, gratings can also be blazed, whereby a special groove profile ensures a higher order of diffraction (the first in this case). At wavelengths of under approx. 200 nm, oxygen, carbon dioxide and water vapour absorb light. To guarantee a good degree of transparency over the required wavelength range, the optical chamber can be evacuated or filled with a suitable gas. Creating a fine vacuum has the advantage of ensuring the wavelength positions remain unaffected by fluctuations in external atmospheric pressure and gas composition. This guarantees the long-term stability of disturbance variables. Furthermore, this results in longer intervals between having to adjust the profile of the optical system. An optical system is required to display a high level of long-term stability in delivering reliable values. This demands a perfect mechanical construction to ensure the optics can be positioned within just a few µm. From time to time, a refractor is used to test and if necessary correct the profile positions at the entrance slit or at a movable entrance slit. Furthermore, the optical system should be screened off from external influences like external temperature and atmospheric pressure. As a result, the optical systems of stationary spark spectrometers are usually thermally stabilised down to several tenths of a degree. Maintaining a certain degree of negative pressure moreover renders a vacuum spectrometer insensitive to fluctuations in external atmospheric pressure. Since the 1960s, photomultipliers (PMs) have established themselves as the standard detectors in the field of spark spectrometry. To begin with, monochromator optics with just one PM were often implemented in a Czerny-Turner mounting. These systems resulted in a complete emission spectrum similar to a photo plate. 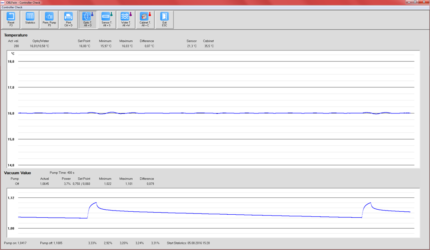 However, this method came with the disadvantage of requiring a lot of time to record the spectrum. If the analytical task is known, it therefore makes more sense to place a PM at every relevant wavelength position. This polychromator can then simultaneously record all the analysis channels. There are various PM types that ensure optimal sensitivity for certain wavelength ranges. A polychromator optical system is thus not fitted with just one type of detector. If the spectrometer is destined to perform a large number of tasks, it will require a large number of analysis channels and PMs, each of which will need some space behind the exit slit. In the case of 50-channel spectrometers, positioning the PMs is no trivial task and something of a challenge for the optics maker. Various PM designs are available today: diameters between 1 and ½ an inch as well as side or head on incident light capture. Multi-channel optics are ideal for small designs. There are further PM types that are “blind” (solar blind) when it comes to certain wavelength ranges. PMs of this nature can be used to detect second-order emission lines. Apart from photomultipliers, solid-state line sensors can be used. Several years ago, CCDs (Charged Coupled Devices) started to be fitted in mobile spectrometers used to test material quality. The first systems have used a wavelength range of about 190 nm up to 600 nm. These sensors are often used in barcode readers or scanners and permit small optics designs. In fact, optics are even available in the form of plug-in PC cards. However, such systems are unsuitable for stationary spark spectrometry as their spectral resolution is not high enough. Apart from that, these barcode line sensors are UV insensitive, which precludes the use of many emission lines and limits the field of application. Emission spectrometer on basis of solid-state detectors have the advantage that the complete emission spectrum can be detected simultaneous at any time. As result systems like this are versatile and have a high flexibility. It is easy to realise multi-matrix applications. To extend the analytic demand is easy to realise without any hardware changes. 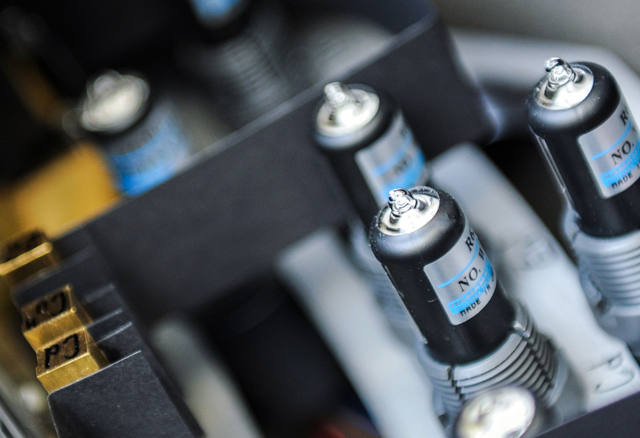 For laboratory spark OES instruments it is essential to optimise the sensors for spectroscopic use. For example the pixel area shall be adapted to the resulting line spectra. Small photosensitive pixel in width and tall pixel in height are optimal for this application. The pixel width of about 10 µm and a height of about 1 mm will fulfil the demands. Further on the sensitivity over a wavelength range of 130 to 800 nm has to be guaranteed. Most standard line sensors show no sensitivity at wavelengths below 250 nm. There are three possibilities to realise an acceptable sensitivity over the complete wavelength range: First, the sensor can be coated with a material what will transform the UV radiation to longer wavelengths. Second, the use of UV absorbing top layers can be avoided during production process of the sensor wafers. Third, a special technique called “back-thinning” can be used. In this case the resulting quantum efficiency will be even higher than for photomultiplier tubes. Area sensors similar to those found in digital cameras can also be used. There are a number of Echelle spectrometers on the market that are fitted with CCD or CID area sensors. Such optics require a second dispersing element, mostly a prism. Insensitivity in the UV range (λ<180 nm) also remains a critical problem with area sensors. Classic photo plates are no longer in use today. This in part unfounded as they display exceptional sensitivity across the complete wavelength range and always display the entire emission spectrum. The introduction of PMT based polychromator optical systems has resulted in a lot of information being lost, but photo plates are unsuitable as a quick, modern method of data logging. OBLF optics are vacuum systems. The dispersive behaviour of alternative gas-filled optical systems is dependent on external pressure. As a consequence, fluctuations in atmospheric pressure can result in an increased need for reprofiling and in some circumstances even lead to an incorrect analysis. In contrast, OBLF vacuum optical systems are insensitive to external conditions and are characterised by excellent transmission properties, even given critical short wavelengths that are needed to detect elements like hydrogen, oxygen, carbon or nitrogen. The system’s superior transmission behaviour remains intact for long periods of time given a suitable vacuum. This also removes the usual maintenance work needed to purge a gas atmosphere. The three-point support ensures the optical frame in the vacuum is thermally and mechanically insulated against the surrounding vacuum chamber. Ambient temperature fluctuations are thus only transmitted via homogeneous radiation and therefore no longer distort the system as is usual with direct heat transfer. Owing to the atmospheric pressure affecting the vacuum chamber, mechanical tension is created, which, however, cannot influence the optical frame due to its mechanical insulation. The long-term behaviour of a spectrometer is not just determined by the optical system, but is also dependent on the temperature coefficient of the data logging unit. Due to the wavelength nature of these temperature coefficients they are unsuitable for electronic compensation. This effect can only be eliminated by maintaining a constant temperature. For that reason, the processor integrated in the vacuum chamber keeps the temperature of the optical system, including data logging unit, within exactly 0.03°C. Sophisticated optical technology – in theory and practice! The special grating illumination and the design of the entrance optics (slits) practically exclude aberrations – and not just in theory! 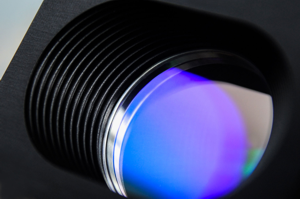 By using only top-quality optical components combined with our extremely strict quality controls, these outstanding optical properties can also be put into practice. Our customers benefit from the excellent resulting signal-to-noise ratio. Satisfying modern demands on high-end spectrometers, for instance the ability to perform additional analyses of extremely short-wave spectral lines or a full complement of assembly groups that remain maintenance free during the entire service life of the spectrometer, depends on intelligent monitoring and corrective mechanisms. All OBLF vacuum optics are therefore fitted with a computer-controlled and motor-driven profiling unit that ensures that the optical system is kept in the same state as it was at the time of calibration during the entire service life of the spectrometer. The stringent requirements that optical systems are expected to satisfy, as described above, cannot be achieved with the help of air- or gas-filled systems for clearly recognisable physical reasons. OBLF therefore concentrated on eliminating the disadvantages of a vacuum optics, namely the high maintenance needs and the possibility of the optics becoming soiled as a result of oil back-diffusion. In classic spectrometers, these disadvantages are solely caused by the vacuum pump, which runs non-stop. If it is turned off and separated from the system, the problems disappear. To enable this, the leak rate must be reduced! In all current OBLF spectrometers, the entire data logging unit has therefore been integrated into the vacuum chamber, which reduces the number of necessary evacuations to a minimum and thus guarantees the lowest possible leakage rates. The need to operate the vacuum pump can be kept to under 5% by computer-logging the leakage rate and coupling pump control. Given a spectrometer operating period of 15 years, the accumulated period of time the pump will operate amounts to no more than 9 months. Terms like pump maintenance and oil back-diffusion are therefore things of the past.